Being a bachelor and out on my own since I was 18 years old has taught me a few things about cooking. One thing was, that you can’t fix a huge meal for one person. You have to know your limitations. Another thing I learned, was how to cook. In cooking for myself, I began to throw somethings together and found that sometimes, it is how you prepare will enhance how it tastes (or at least in my mind). 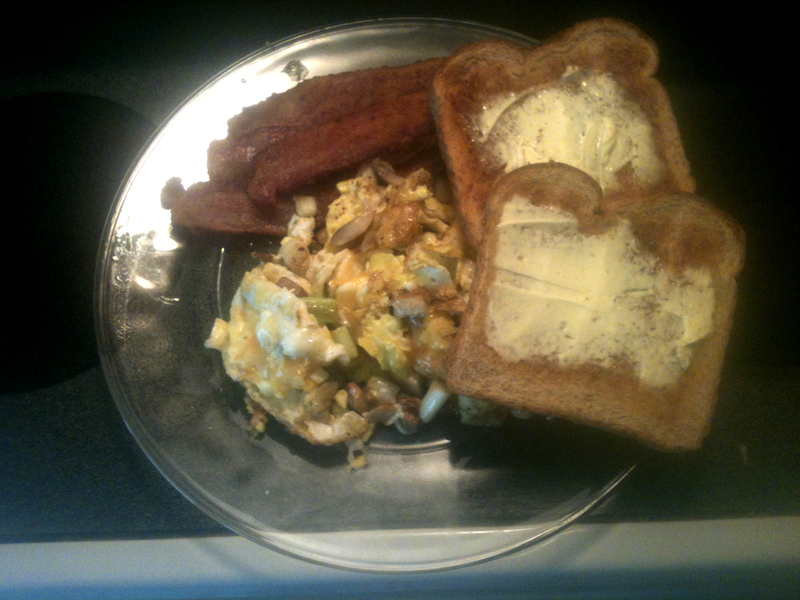 So, today, I decided to share how I make my scrambled eggs. When you read this post and hopefully try this, I ask that you come back and comment and rate this post. I want to know what everyone thinks. 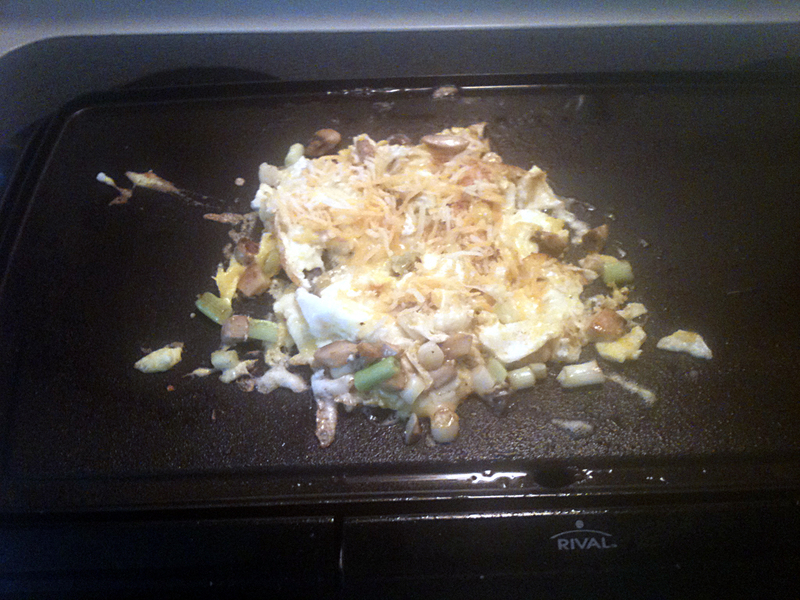 Ok, to begin with, it doesn’t matter what you cook in, but I prefer a flat hotplate. It makes it easier to use your spatula. The second thing that I would suggest is that you cook your bacon on the hotplate first, leaving the bacon grease. You can use oil, or butter or whatever you want, I just prefer bacon grease for the taste. 1. Chop up some green onions, mushrooms, hot peppers (and any other ingredient that you like) and put it on one side of the hotplate. Then I crack eggs, and put them on the other side, without busting the yoke. 2. Cook the eggs (sunnyside up) until they are almost done. Making sure that the clear parts of the eggs turn white. 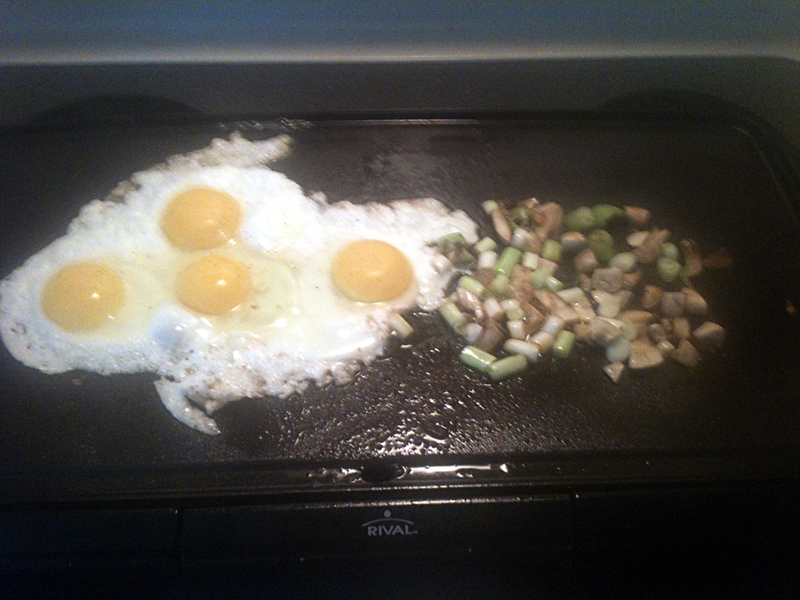 Then take the vegtables and put them on top of the eggs and cook for about 1-2 minutes more. 3. 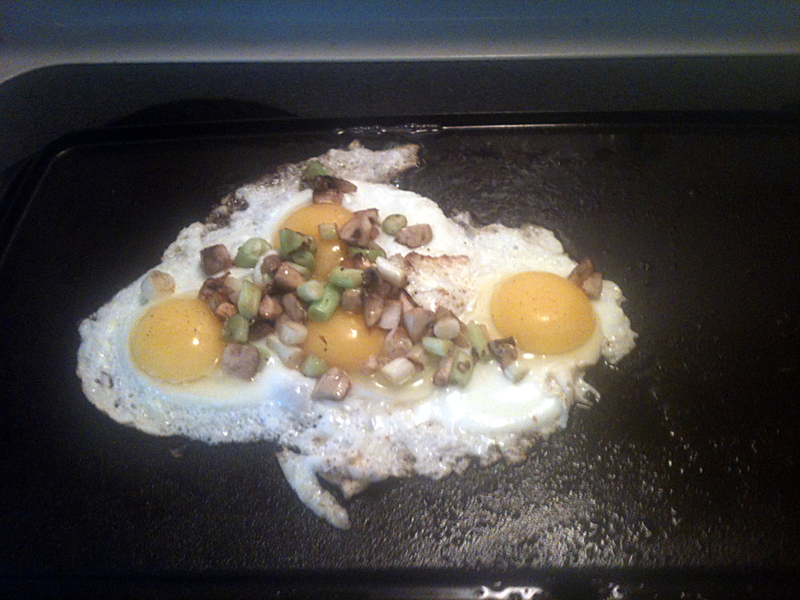 I then chop the eggs and vegtables together (do not stir) making sure not to burn the bottom. 4. Personally, I love cheese on everything, so I take shredded cheese (cheese slices work well too) and add it to the eggs and cook for about one minute longer to allow the cheese to begin to melt. This helps keep everything together too. 5. Once your cheese has melted, it is done. Put it on your plate, along with the bacon and toast and you have a great tasting breakfast with a different texture. Enjoy! I will be posting more recipes, some handed down, some I made up, but all easy to make! Again, please let me know what you think of this by commenting/rating this post. I am interested in how it turned out for you.